Stanford University at the 2013 Head of the Charles. Photo by Peter Spurrier. PRINCETON, N.J. — As athletes around the U.S. are focusing on their goals for championship racing, the USRowing’s week seven coaches poll saw very little movement, with the top five places holding steady for most of the polls. With all of the first-place votes, the University of California maintained their ranking at number one. The Bears are preparing to face off against the second-place University of Washington at the 2017 Pac-12 Championships on Lake Natoma, Calif., this weekend. The UW men haven’t lost a race this season, aside from its losses in the first varsity eight and the freshman eight at the Cal Dual. On the east coast, third-place Yale University will be challenging fourth-place Harvard University and fifth-place Princeton University at the 2017 Men’s Sprints (EARC) on Sunday, May 14 at Lake Quinsigamond in Worcester, Mass. For the lightweight men, Cornell University led the field with all eight first-place votes. In second was Harvard. Yale was ranked third, and Princeton and the University of Pennsylvania rounded out the top five. Nine out of the top 10 lightweight men’s crews will be racing at the 2017 Men’s Sprints. In the lightweight women’s poll, Stanford University held first, where they have been all season. The top-ranked Cardinal lightweight rowing program defeated No. 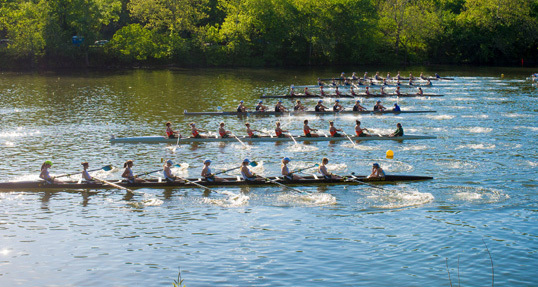 4 Princeton on Lake Carnegie in Princeton, N.J., to take the Class of 2015 Cup. Next up for Stanford is the Pacific Coast Rowing Championship on May 13 on Lake Natoma. Second-place Harvard-Radcliffe won the varsity eight medal at the Women’s Eastern Sprints, held on Lake Quinsigamond. The University of Wisconsin finished third. Princeton and Boston University ranked fourth and fifth, respectively. Why small changes in pitch can have a big impact on your rowing.